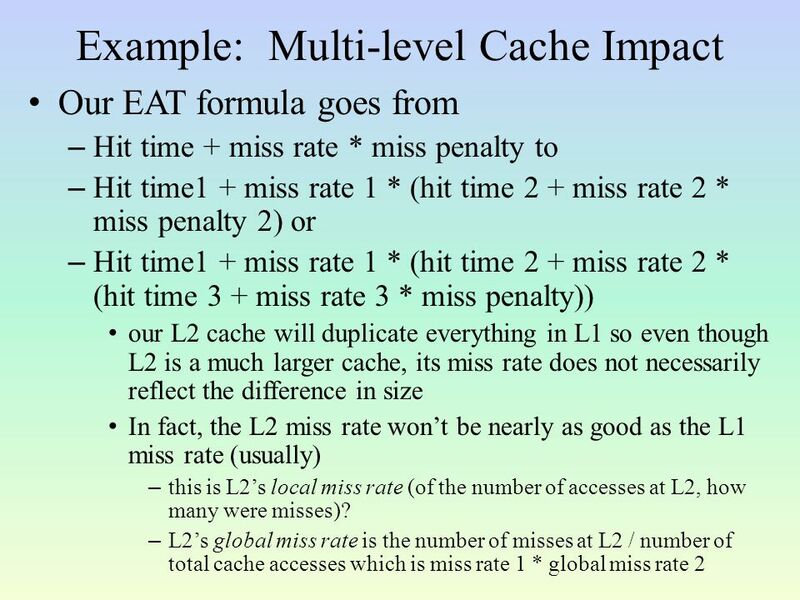 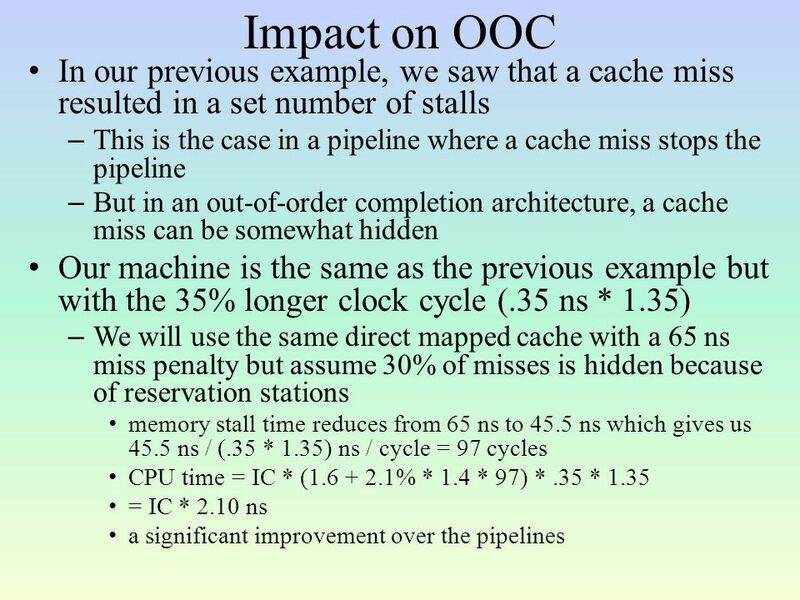 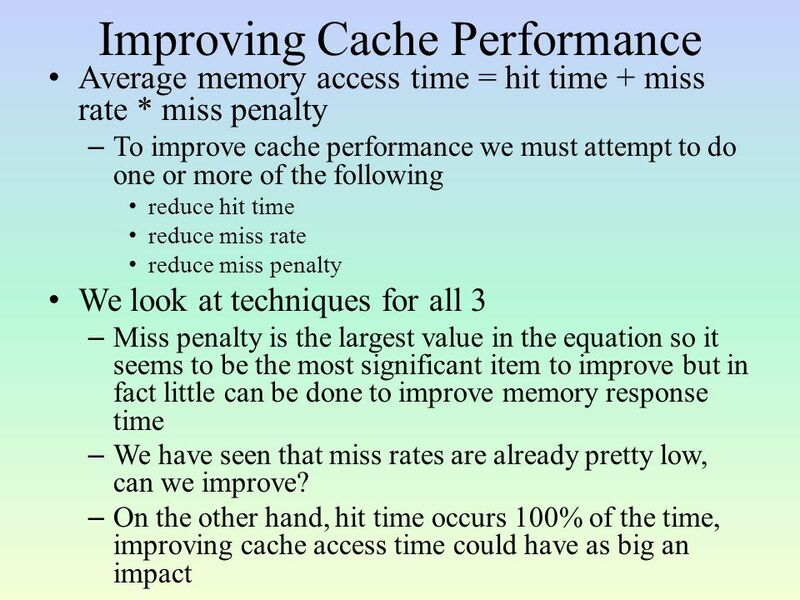 Cache Here we focus on cache improvements to support at least 1 instruction fetch and at least 1 data access per cycle – With a superscalar, we might need. 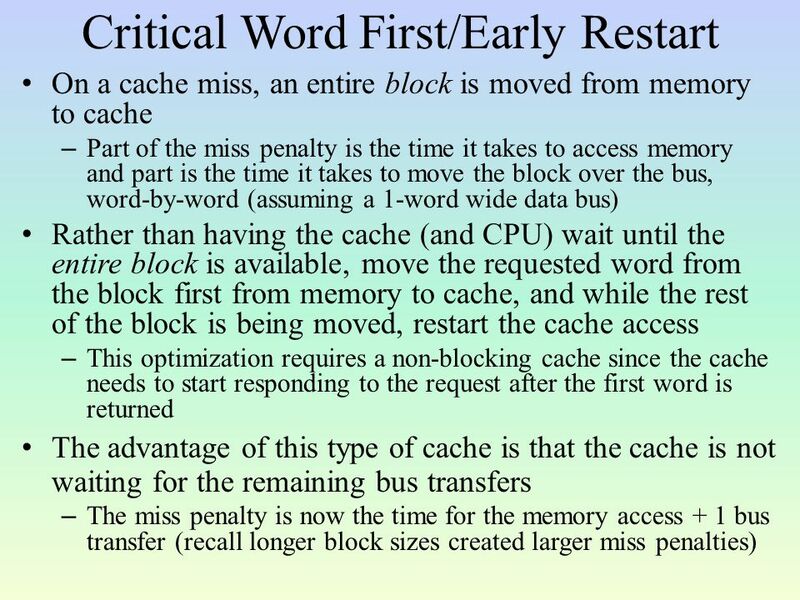 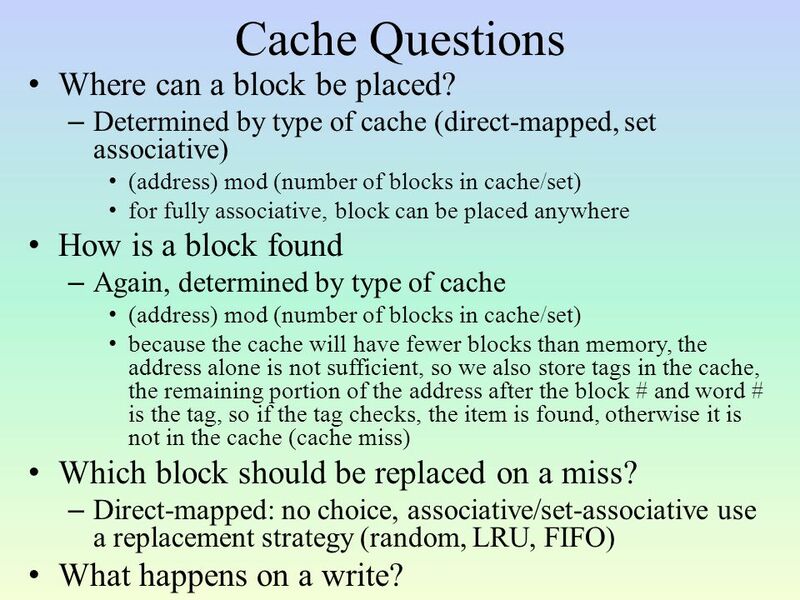 4 Cache Questions Where can a block be placed? 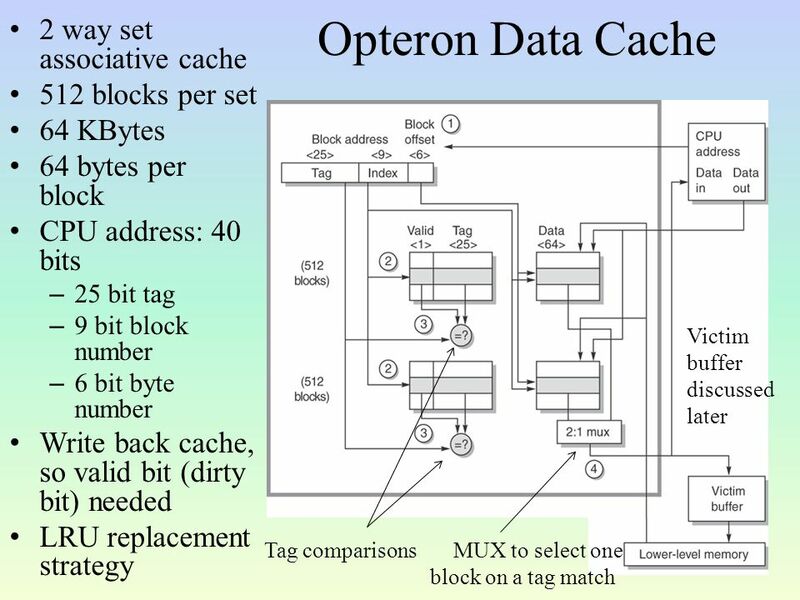 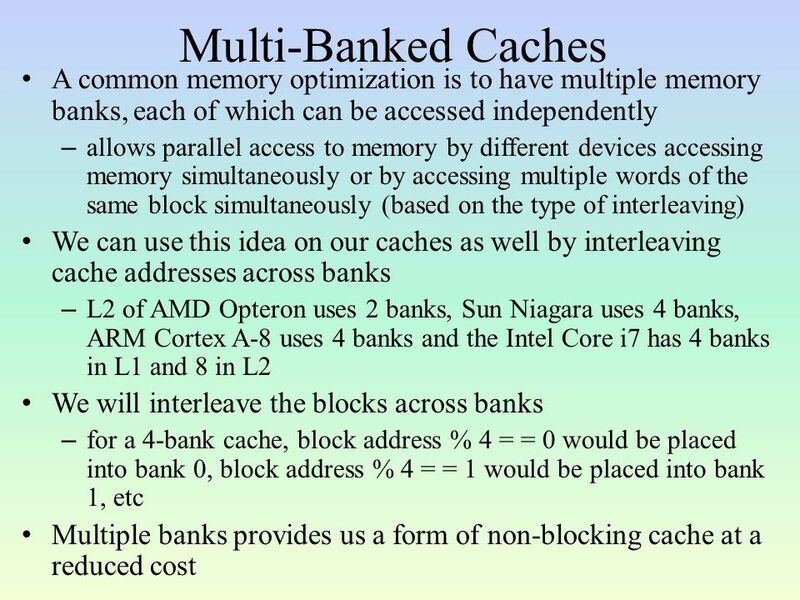 – Determined by type of cache (direct-mapped, set associative) (address) mod (number of blocks in cache/set) for fully associative, block can be placed anywhere How is a block found – Again, determined by type of cache (address) mod (number of blocks in cache/set) because the cache will have fewer blocks than memory, the address alone is not sufficient, so we also store tags in the cache, the remaining portion of the address after the block # and word # is the tag, so if the tag checks, the item is found, otherwise it is not in the cache (cache miss) Which block should be replaced on a miss? 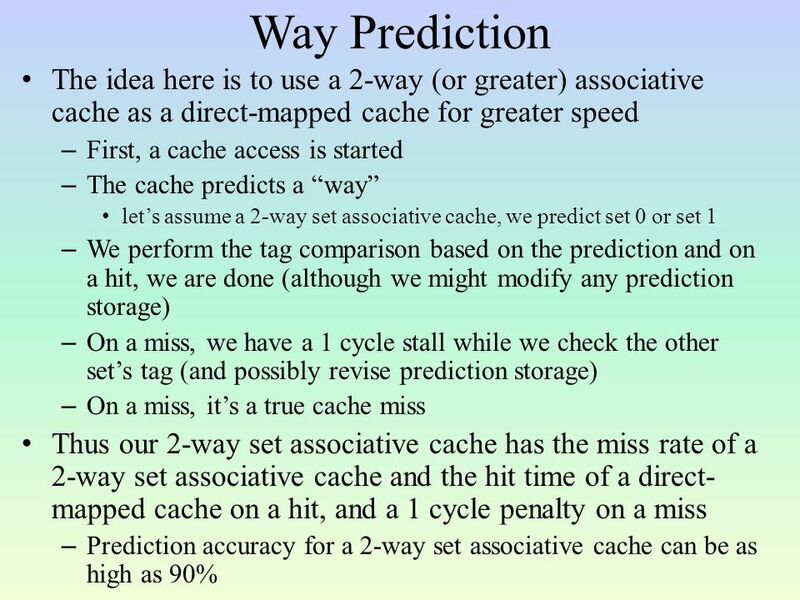 – Direct-mapped: no choice, associative/set-associative use a replacement strategy (random, LRU, FIFO) What happens on a write? 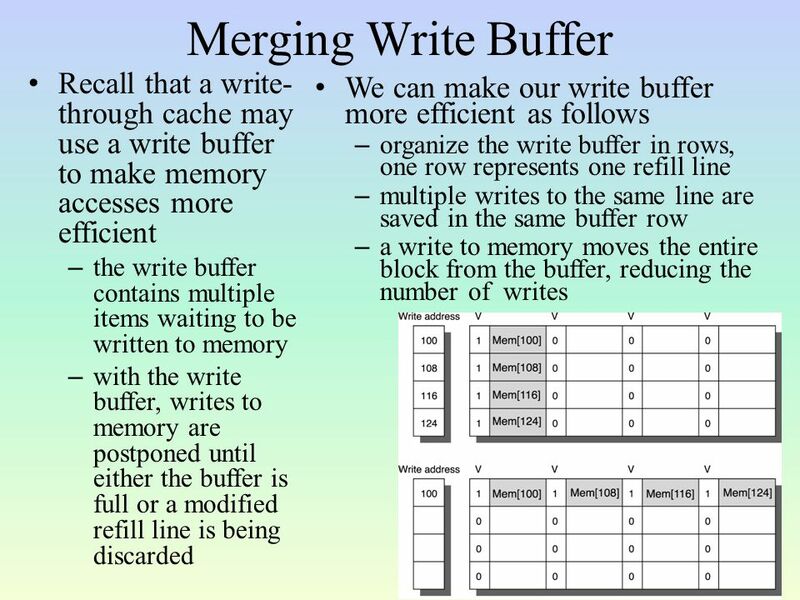 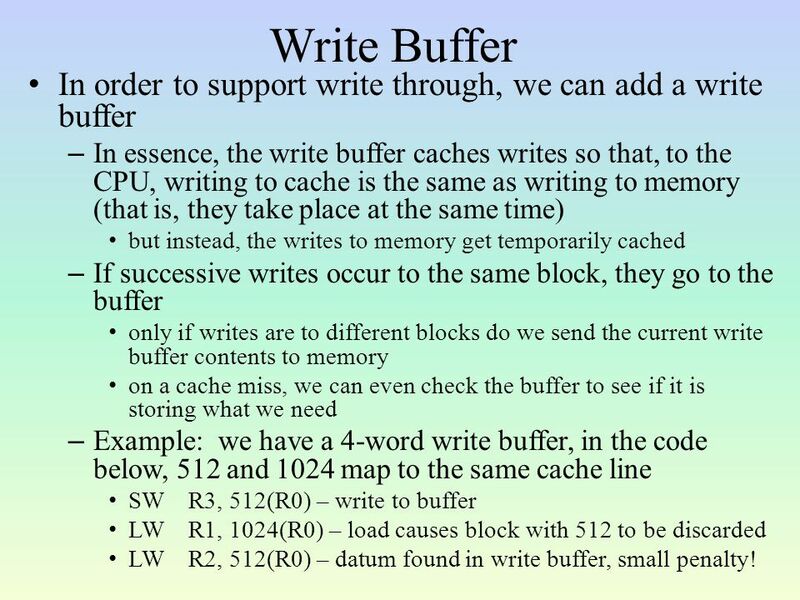 8 Write Buffer In order to support write through, we can add a write buffer – In essence, the write buffer caches writes so that, to the CPU, writing to cache is the same as writing to memory (that is, they take place at the same time) but instead, the writes to memory get temporarily cached – If successive writes occur to the same block, they go to the buffer only if writes are to different blocks do we send the current write buffer contents to memory on a cache miss, we can even check the buffer to see if it is storing what we need – Example: we have a 4-word write buffer, in the code below, 512 and 1024 map to the same cache line SWR3, 512(R0) – write to buffer LWR1, 1024(R0) – load causes block with 512 to be discarded LWR2, 512(R0) – datum found in write buffer, small penalty! 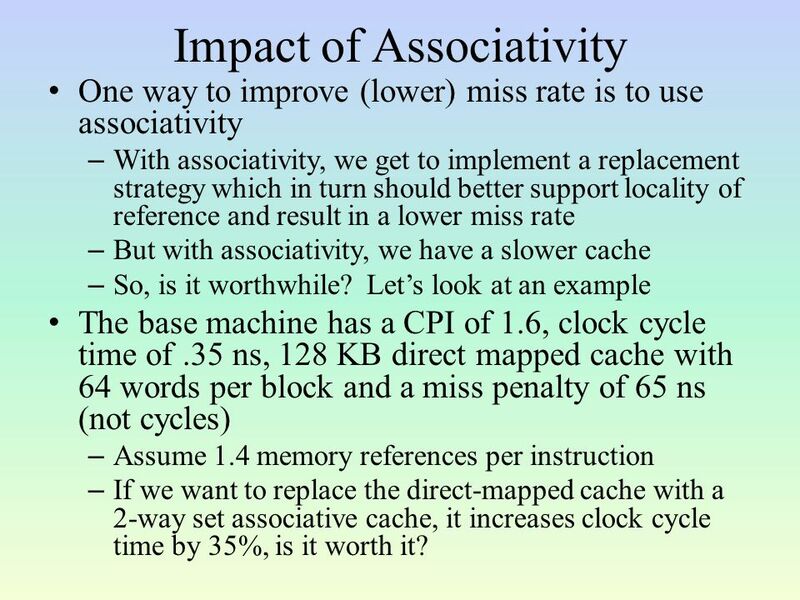 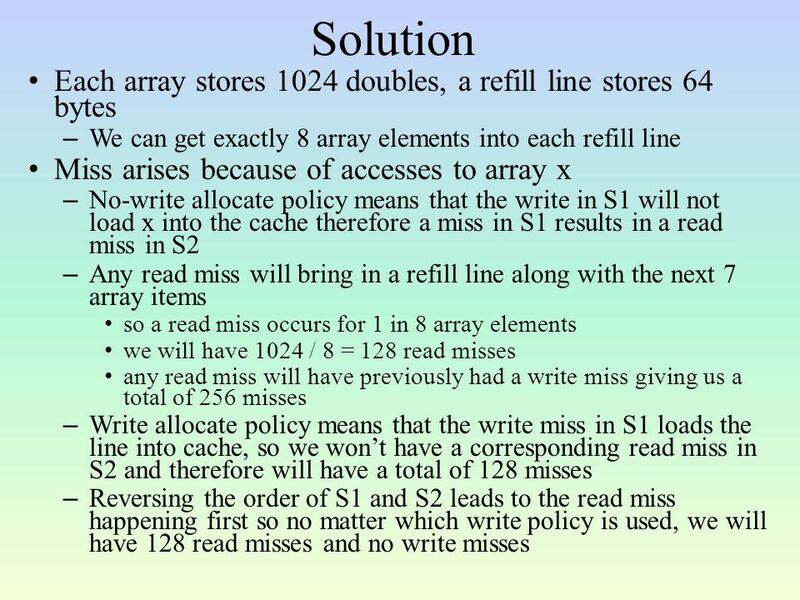 12 Impact of Associativity One way to improve (lower) miss rate is to use associativity – With associativity, we get to implement a replacement strategy which in turn should better support locality of reference and result in a lower miss rate – But with associativity, we have a slower cache – So, is it worthwhile? 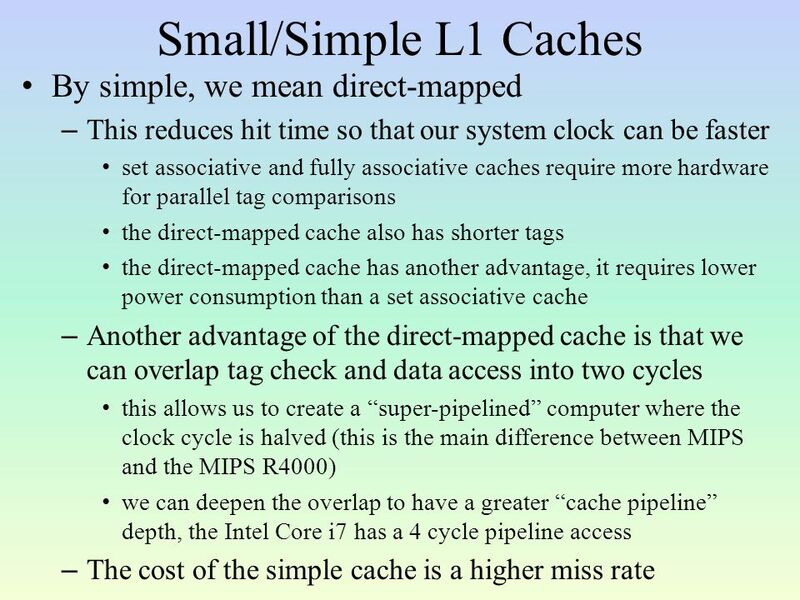 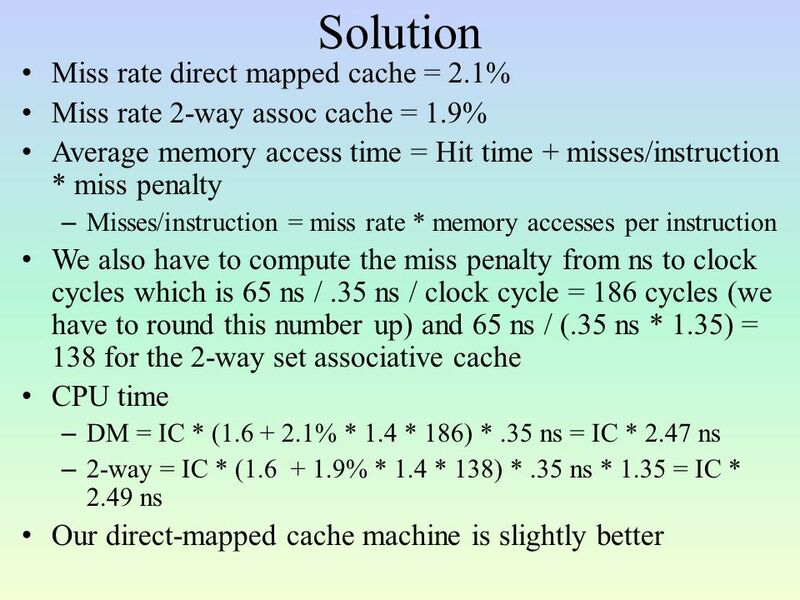 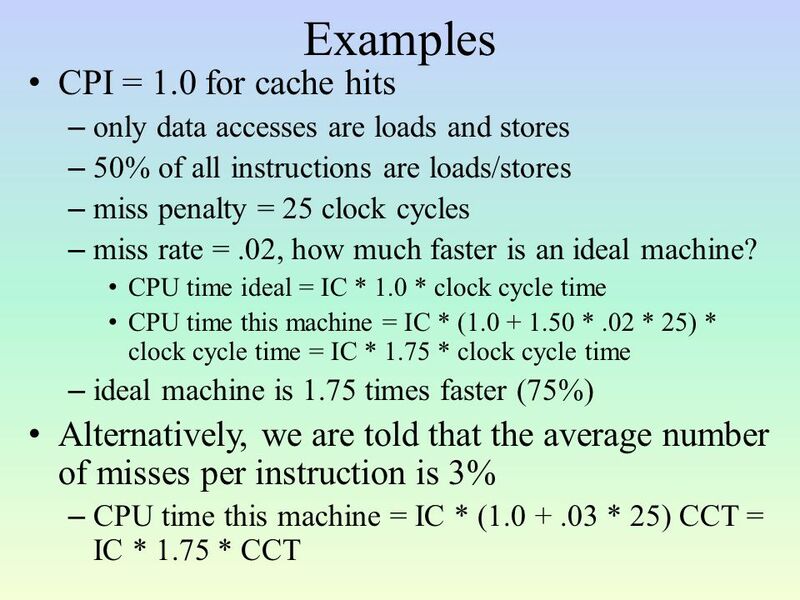 Let’s look at an example The base machine has a CPI of 1.6, clock cycle time of.35 ns, 128 KB direct mapped cache with 64 words per block and a miss penalty of 65 ns (not cycles) – Assume 1.4 memory references per instruction – If we want to replace the direct-mapped cache with a 2-way set associative cache, it increases clock cycle time by 35%, is it worth it? 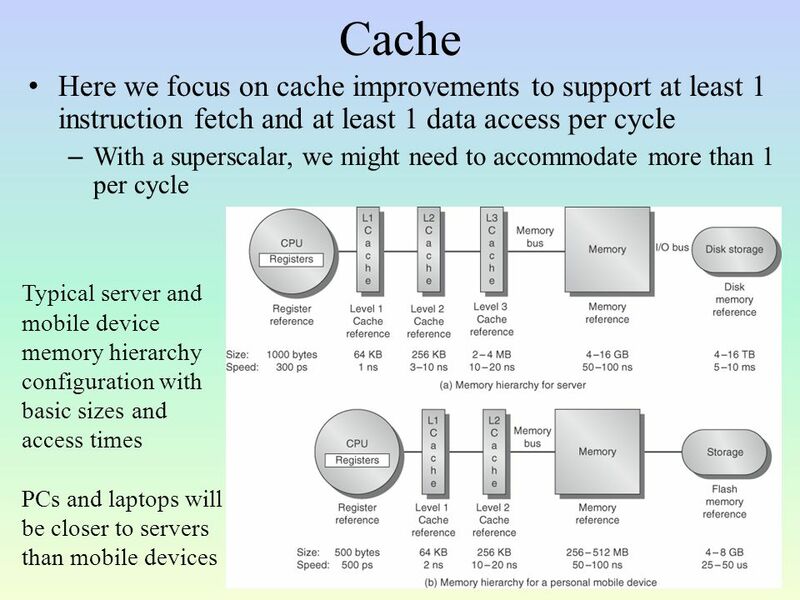 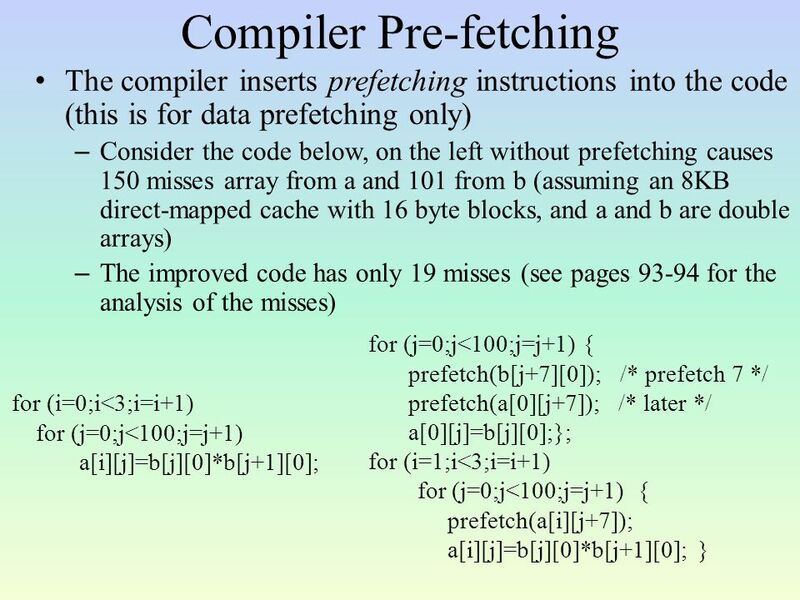 Download ppt "Cache Here we focus on cache improvements to support at least 1 instruction fetch and at least 1 data access per cycle – With a superscalar, we might need." 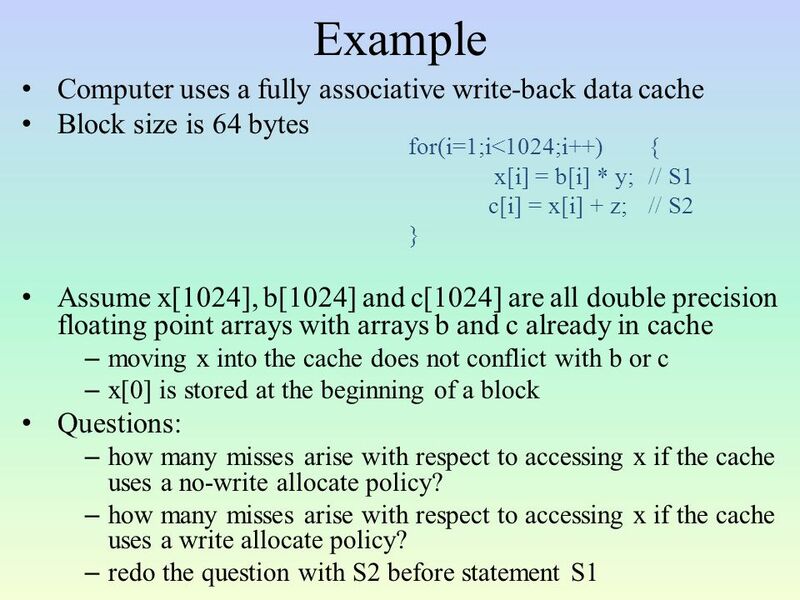 Practical Caches COMP25212 cache 3. 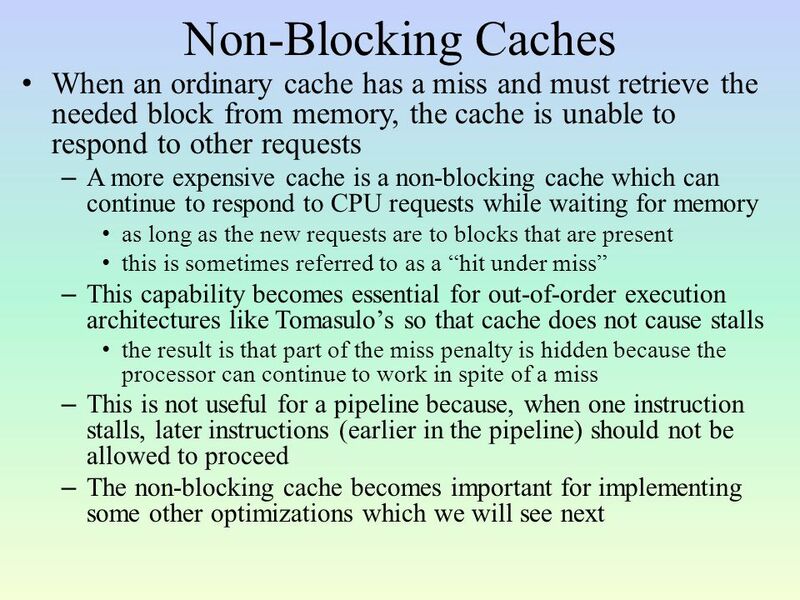 Learning Objectives To understand: –Additional Control Bits in Cache Lines –Cache Line Size Tradeoffs –Separate I&D. 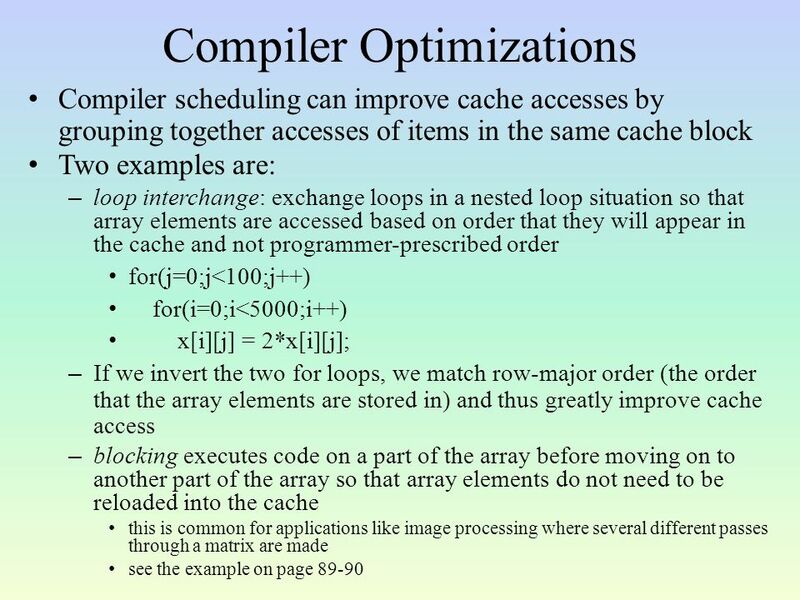 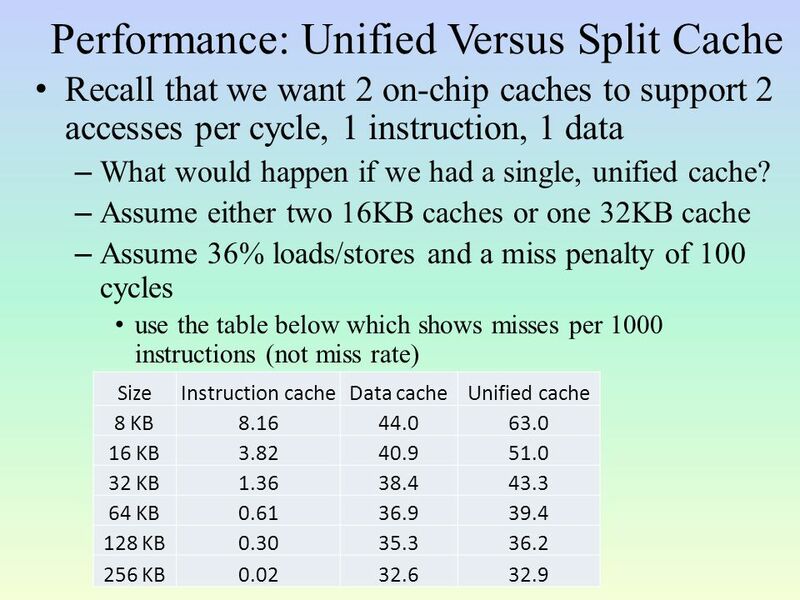 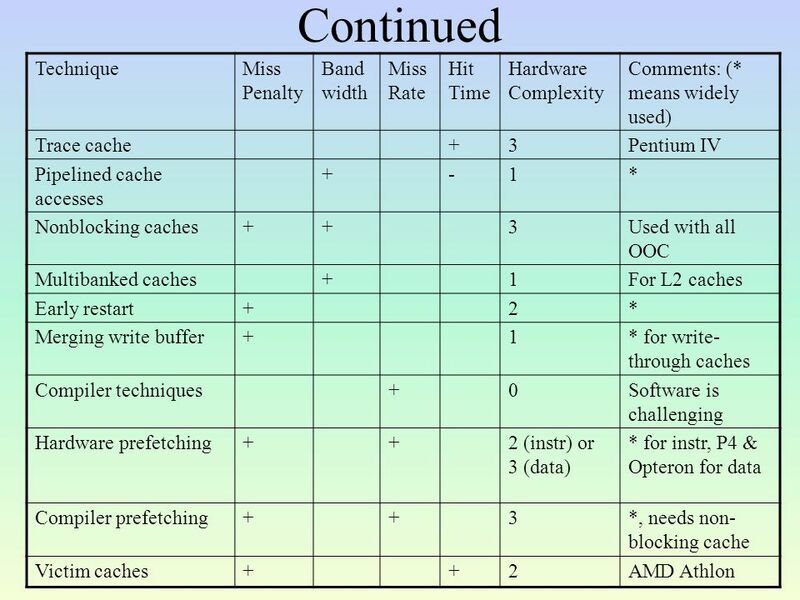 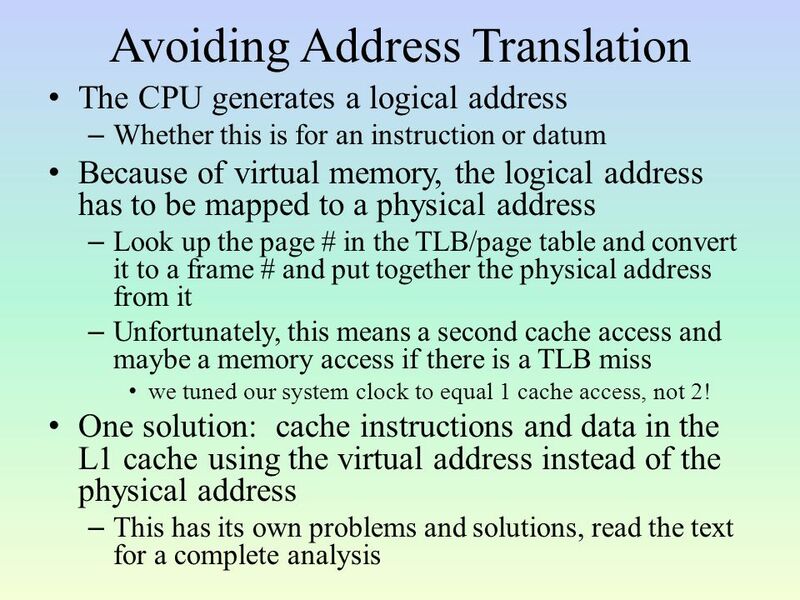 1 Adapted from UCB CS252 S01, Revised by Zhao Zhang in IASTATE CPRE 585, 2004 Lecture 14: Hardware Approaches for Cache Optimizations Cache performance. 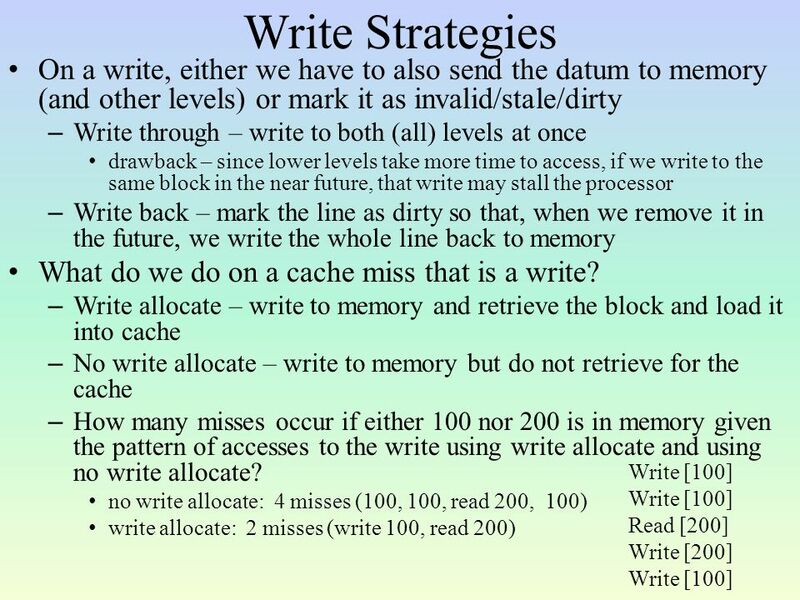 11/8/2005Comp 120 Fall November 9 classes to go! 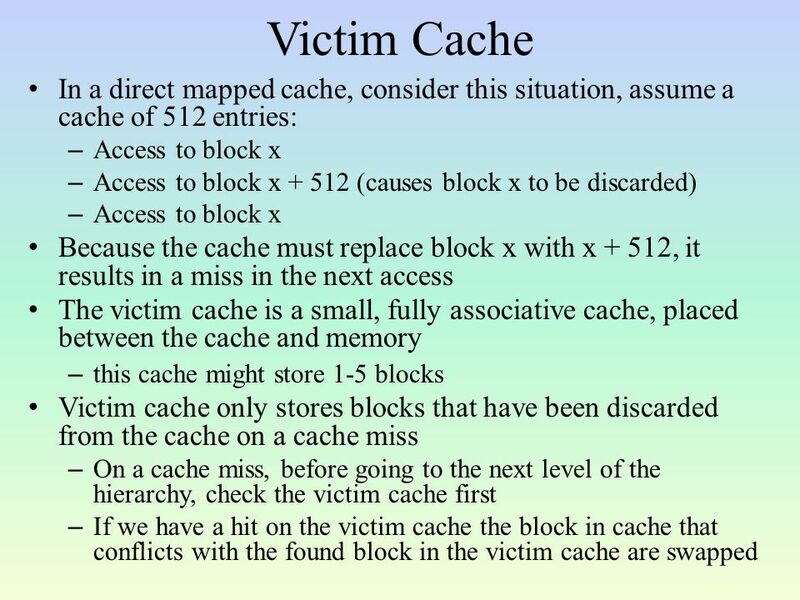 Read Section 7.5 especially important! 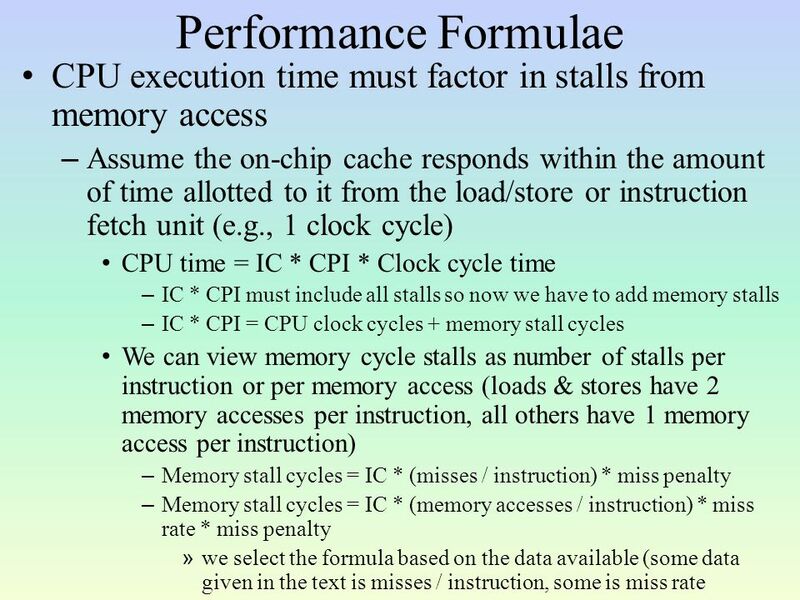 The Memory Hierarchy CPSC 321 Andreas Klappenecker. 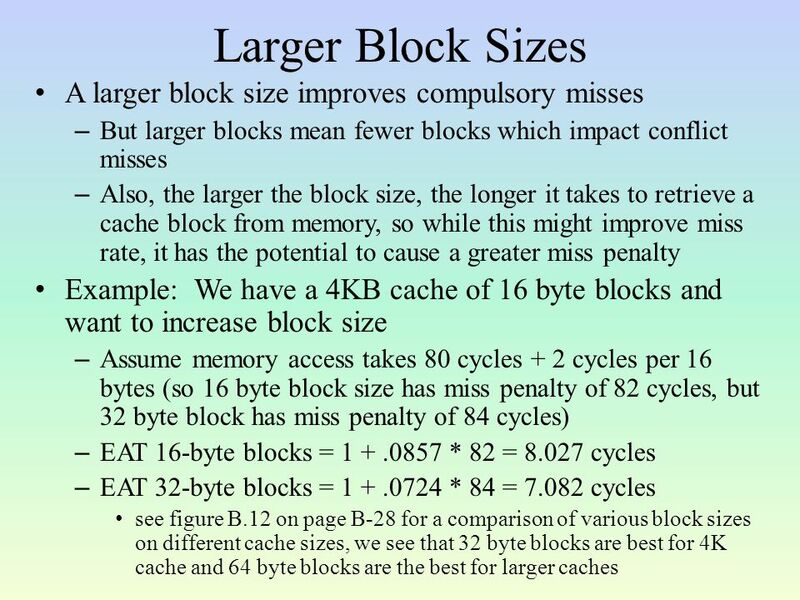 1  1998 Morgan Kaufmann Publishers Chapter Seven Large and Fast: Exploiting Memory Hierarchy. 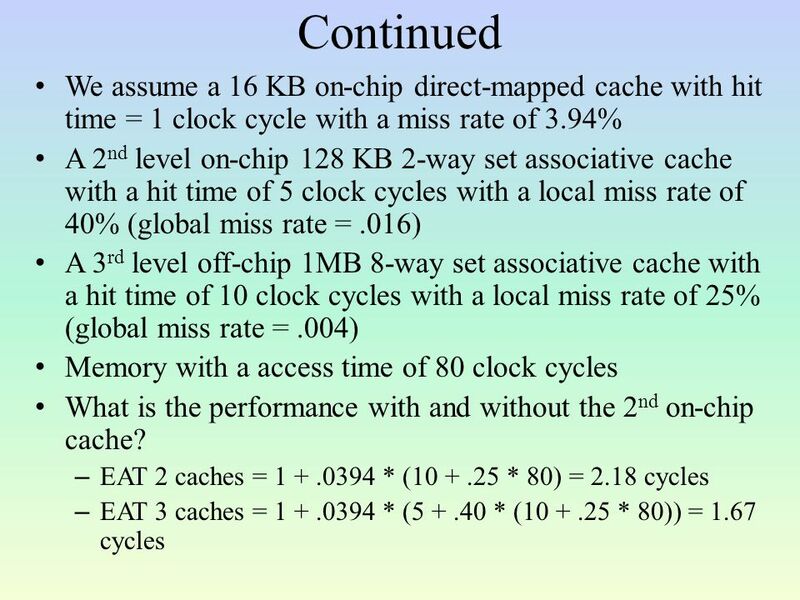 Review CPSC 321 Andreas Klappenecker Announcements Tuesday, November 30, midterm exam. 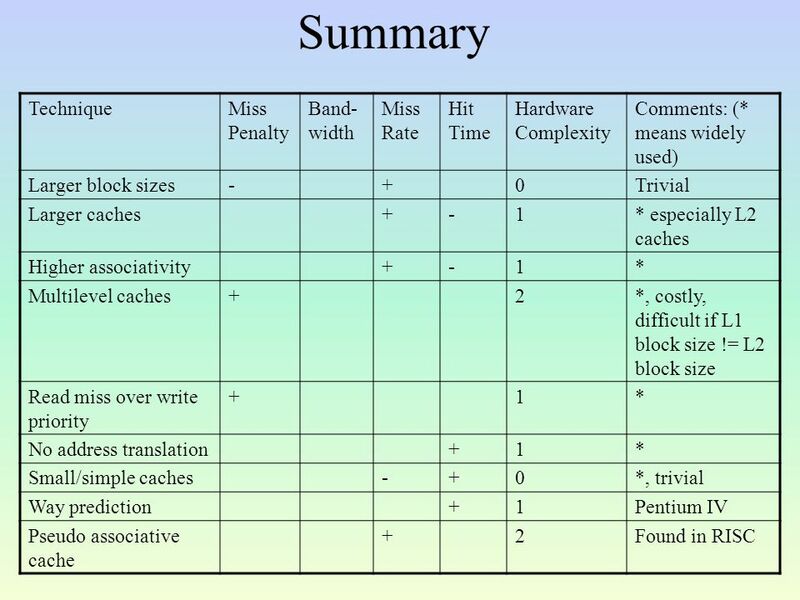 1 Chapter Seven Large and Fast: Exploiting Memory Hierarchy. 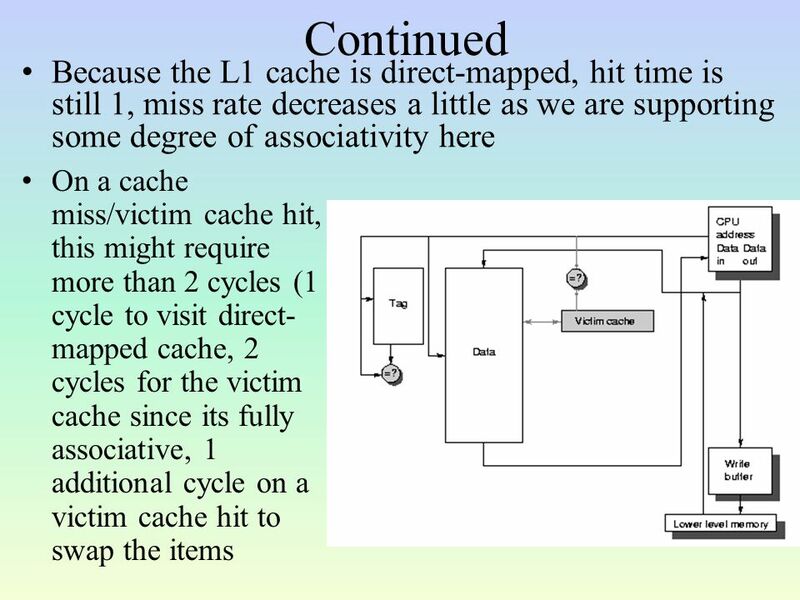 Cache Memory Adapted from lectures notes of Dr. Patterson and Dr. Kubiatowicz of UC Berkeley. 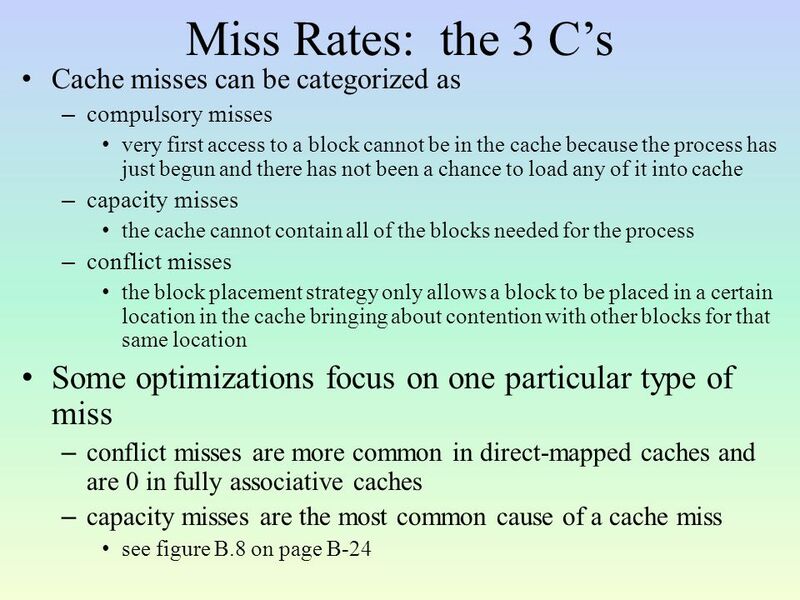 1 COMP 206: Computer Architecture and Implementation Montek Singh Mon, Oct 31, 2005 Topic: Memory Hierarchy Design (HP3 Ch. 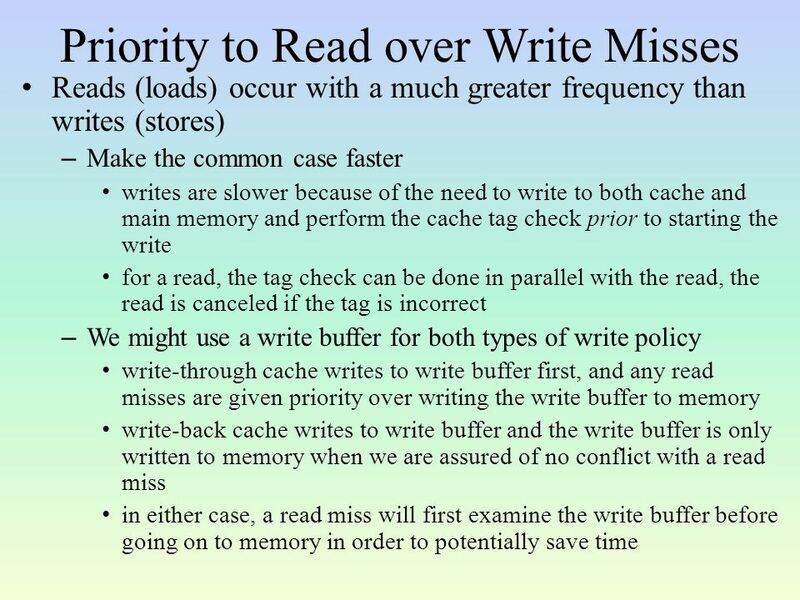 5) (Caches, Main Memory and. 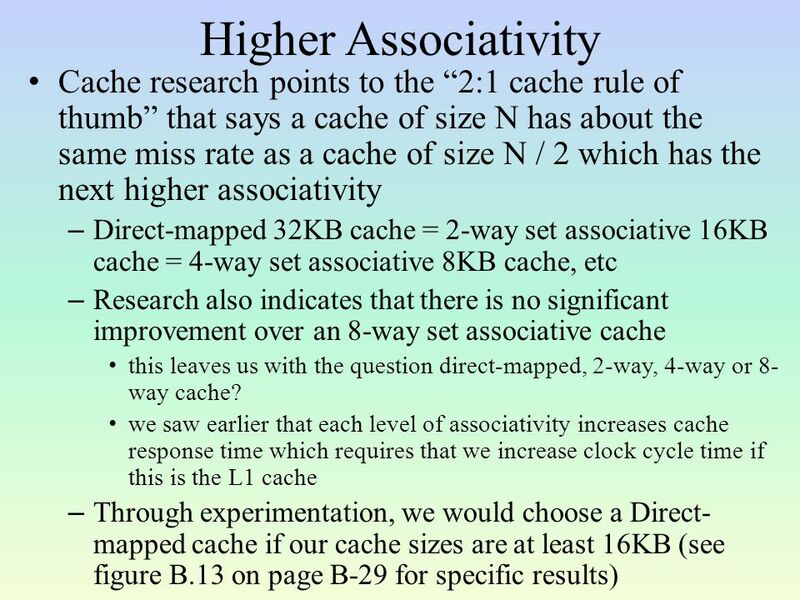 Memory Chapter 7 Cache Memories. 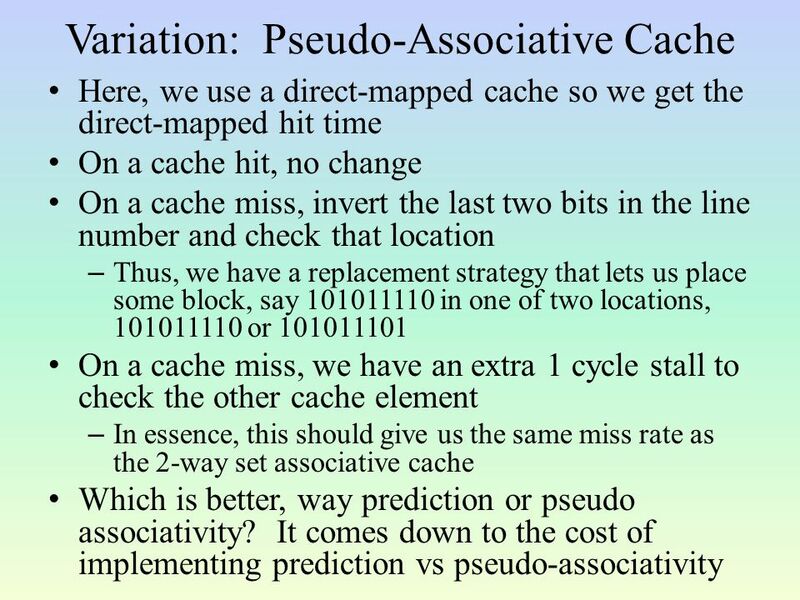 ENGS 116 Lecture 121 Caches Vincent H. Berk Wednesday October 29 th, 2008 Reading for Friday: Sections C.1 – C.3 Article for Friday: Jouppi Reading for. 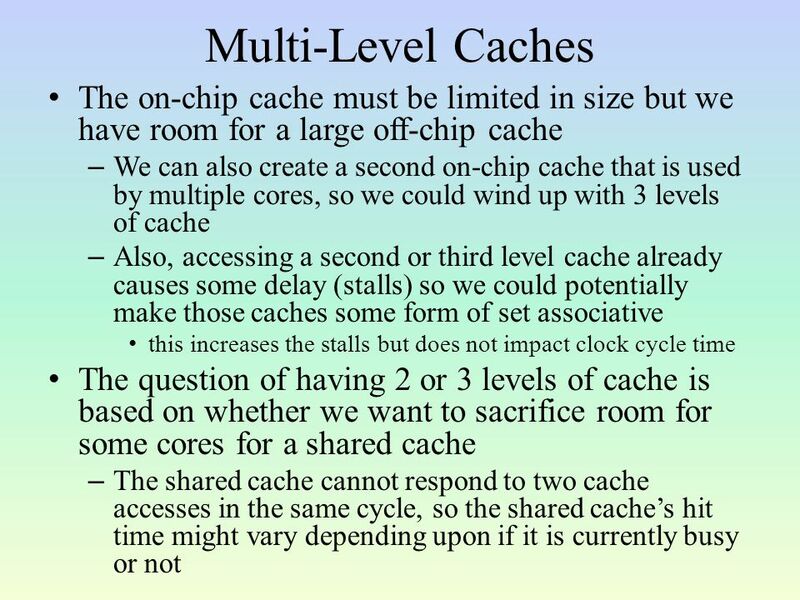 Caching I Andreas Klappenecker CPSC321 Computer Architecture.